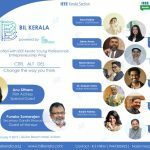 The kick start event of IEEE Kochi Subsection and IEEE Kerala Young Professionals 2017, Excellentia 1.0 was conducted on 29th January 2017 at Albertian Institute of Science and Technology, Kalamassery. It was a well-organized event aimed at imparting information to improve a candidate’s performance and was well crafted to completely give a full-fledged insight on how to appear for a placement drive, delivering the rightly chosen information by reputed industry and subject matter experts within the IEEE circle of volunteers. The one-day event began with Prof. Paul Ansel, Secretary, IEEE Kochi Subsection, welcoming the gathering. Followed by, Ms. Irene Susan Mathew, Volunteer, IEEE Kerala Young Professionals led the gathering through the IEEE Code of Ethics. Ms. Mini Ulanat, Chair IEEE Kochi Subsection presided the event. The event was formally inaugurated by Dr. Suresh Nair, Chair, IEEE Kerala Section who was the guest of honor of the event. He further addressed the gathering with certain key facts regarding what an interviewer expects from a candidate appearing for a placement drive and some thought provoking situations he has come across being an interviewer for a long while. He stressed the importance of having deep knowledge in understanding the basics of one’s area of specialization. Ms. Rekha James, Treasurer, IEEE Kochi Subsection delivered the vote of thanks hence concluding the formal inauguration ceremony. The event witnessed an overall participation of 24 students from various colleges within the Kochi Subsection. The event started with the session on the art of Resume Making, Group Discussions and Interview Tips by Mr. Vijay S Paul, Electronic Communications Coordinator, IEEE Kerala Section. The main aim of the session was to prepare the students for the interview and its basic requirements as a pre-requisite to aid the whole process while grooming oneself towards achieving one’s dream job. He also shared with the participants some of the worst experiences he had being an interviewer. Post lunch, the Mock Group Discussion was conducted. The participants were divided into 4 groups and each group was given a topic to discuss for 10 minutes. The next in line was the session on “How to sell yourself and win an Engineering Gig” handled by Mr. Rahul Ramesh, CTO, Entri.me. He took the participants on a roller coaster ride on the reality of being an Engineer and all that follows behind. An in-depth mining on what should be done to get a job being an engineering graduate and to make oneself a competent candidate was carried out. The last but the most needed session of the event was the session on Technical Interview and the current trends in the industry. This session by Mr. Shahim Baker, Chair, IEEE Kerala Young Professionals took the participants to a new level of technical knowhow that will bag them the confidence to clear a technical interview round and also discussed with the participants the current trends prevailing in the industry. An open forum was put on for the participants to clarify all their queries and a quick feedback was also taken. The event came to an end with the valedictory note by Mr. Abey Easow Joseph, Coordinator, Excellentia 1.0 expressing his gratitude to the speakers and a message to the participants to utilize the full of what they gained from the event and make themselves a better candidate and even more an employable Engineer.